The lips are the focal point of the face during social interactions. The lips are composed of skin, muscle, and mucosa, and they lack direct bony attachments or infrastructure. Hence, the lips are elastic and pliable; these characteristics are both advantages and disadvantages during surgical reconstruction. The lips play many important roles and are particularly important in both verbal and nonverbal communication. They are necessary for articulation of the letters B, F, M, N, and V.  In addition, people use their lips to communicate a variety of feelings through facial expression. The lips serve important functions in eating and imbibition. The competence of the oral sphincter is important during chewing and sucking through a straw. The lips are divided into three main sections: cutaneous, vermilion, and mucosal. The upper cutaneous lip is bordered superiorly by the nasal sill and columella, laterally by the nasolabial fold, and inferiorly by the vermilion lip. The upper lip is composed of three cosmetic units: two lateral and one medial. The lateral units are bordered by the nasolabial groove laterally and by the philtral crests medially. The medial philtral subunit is composed of the two convex philtral crests and the central philtral groove. See the anatomic diagrams below. 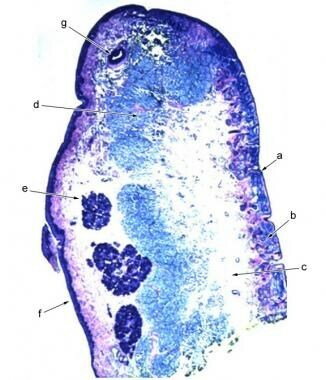 Histologic cross section of the lip showing the anatomic layers: epidermis of cutaneous lip (A), dermis of cutaneous lip (B), subcutaneous tissue of cutaneous lip (C), orbicularis oris muscle (D), lamina propria of mucosal lip with salivary glands (E), mucosa of mucosal lip (F), labial artery (G). Anatomy of the lip region. Cosmetic units of the lip. The Cupid's bow is the downward projection of the philtral unit, which gives the lip its characteristic appearance. The white roll is the light linear projection that circumferentially outlines the upper and lower lip at the border of the cutaneous and vermilion lip. Reconstruction of the Cupid's bow and the white roll is crucial in preserving the aesthetic nature of the lip; even slight alterations or misalignments of these areas are overtly noticeable. 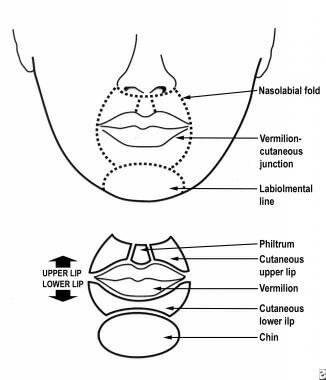 The lower cutaneous lip is bordered superiorly by the lower vermilion lip; laterally by the extension of the nasolabial folds; and inferiorly by the mental crease, which separates the lower lip from the chin. This portion of the lip makes up 1 cosmetic unit. The relaxed skin tension lines emanate from the vermilion in a radial fashion and are perpendicular to the fibers of the orbicularis oris muscle. Knowledge of the cross-sectional anatomy of the lip is important to the dermatologic surgeon. Starting from the external surface, the layers are as follows: epidermis of the cutaneous lip, dermis of the cutaneous lip, subcutaneous tissue of the cutaneous lip, orbicularis oris, submucosal of the mucosal lip, and mucosa of the mucosal lip. 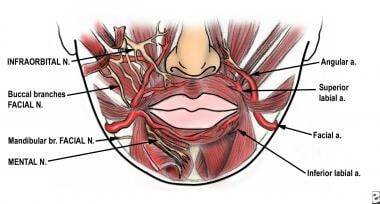 The sensory innervation of the upper lip is derived from branches of the trigeminal nerve (cranial nerve V). The upper lip is supplied by the infraorbital nerve, which exits the maxilla at the infraorbital foramen. Sensation in the lower lip is derived from the mental nerve, which exits the mandible at the mental foramen. The identification of these nerves is useful in performing nerve blocks for lip surgery. Motor innervation of the perioral muscles is supplied from the facial nerve (cranial nerve VII). The buccal branch of the facial nerve innervates the orbicularis oris muscle and the lip elevators. The marginal mandibular branch of the facial nerve innervates the orbicularis oris and lip depressors. This nerve is most susceptible to injury at the middle portion of the mandible, where it is most superficial. The primary muscle of the lip is the circumferential orbicularis oris muscle. This muscle has no direct bony attachments, but rather, it is suspended from the surrounding muscles that attach into it. The orbicularis primarily acts as a sphincter, closing the mouth and keeping the lips closed. However, through complex movements, this muscle also functions in puckering, sucking, whistling, blowing, and creating facial expressions. The lip elevators are composed of the levator labii superioris alaeque nasi, levator labii superioris, zygomaticus major, zygomaticus minor, and levator anguli oris muscles. The upper lip retractors are the zygomaticus major, zygomaticus minor, and levator anguli oris muscles. The lip depressors are the depressor anguli oris and depressor labii inferioris muscles. The lower lip retractors are the depressor anguli oris and platysma muscles. The mentalis muscle causes the lower lip to protrude. No absolute contraindications exist for this procedure. Salasche SJ, Bernstein G, Senkarik M. Surgical Anatomy of the Skin. Stamford, Conn: Appleton & Lange; 1988. 223-40. Salmon P, Mortimer N. Reconstruction of the upper lip. Dermatol Surg. 2013 May. 39(5):789. [Medline]. Litani C, Maize JC, Cook J. An interesting observation in lip reconstruction. Dermatol Surg. 2010 May. 36(5):704-12. [Medline]. Leonard AL, Hanke CW. Second intention healing for intermediate and large postsurgical defects of the lip. J Am Acad Dermatol. 2007 Nov. 57(5):832-5. [Medline]. Gloster HM Jr. The use of second-intention healing for partial-thickness Mohs defects involving the vermilion and/or mucosal surfaces of the lip. J Am Acad Dermatol. 2002 Dec. 47(6):893-7. [Medline]. Pepper JP, Baker SR. Local flaps: cheek and lip reconstruction. JAMA Facial Plast Surg. 2013 Sep-Oct. 15 (5):374-82. [Medline]. Zitelli JA, Brodland DG. A regional approach to reconstruction of the upper lip. J Dermatol Surg Oncol. 1991 Feb. 17(2):143-8. [Medline]. Huang CC, Arpey CJ. The lips. Excision and repair. Dermatol Clin. 1998 Jan. 16(1):127-43. [Medline]. Rohrer TE, Cook JL, Nguyen TH, eds. Flaps and Grafts in Dermatologic Surgery. Philadelphia, Pa: Saunders; 2008. Calhoun KH. Reconstruction of small- and medium-sized defects of the lower lip. Am J Otolaryngol. 1992 Jan-Feb. 13(1):16-22. [Medline]. Boggio P, Pertusi G, Annali G, et al. Full-thickness triangular advancement flap for the closure of lateral upper lip defects. Dermatol Surg. 2011 Feb. 37(2):237-41. [Medline]. Ducic Y, Athre R, Cochran CS. The split orbicularis myomucosal flap for lower lip reconstruction. Arch Facial Plast Surg. 2005 Sep-Oct. 7(5):347-52. [Medline]. Webster JP. Crescentic peri-alar cheek excision for upper lip flap advancement with a short history of upper lip repair. Plast reconstr surg (1946). 1955 Dec. 16(6):434-64. [Medline]. Lopiccolo MC, Kouba DJ. Bilateral Peri-Alar Advancement Flap to Close a Midline Upper Lip Defect. Dermatol Surg. 2011 Apr 14. [Medline]. Kaufman AJ. Surgical gem: island advancement flaps for lip reconstruction. Australas J Dermatol. 2014 Aug. 55 (3):201-3. [Medline]. Ray TL, Chow S, Lee PK. Myocutaneous island pedicle "sling" flap for correction of central upper cutaneous (philtral) lip defects. Dermatol Surg. 2010 May. 36(5):671-4. [Medline]. Kaufman AJ. Bilateral vermilion rotation flap. Dermatol Surg. 2006 May. 32(5):721-5; discussion 725. [Medline]. Eirís N, Suarez-Valladares MJ, Cocunubo Blanco HA, Rodríguez-Prieto MÁ. Bilateral mucosal rotation flap for repair of lower lip defect. J Am Acad Dermatol. 2015 Mar. 72 (3):e81-2. [Medline]. Singh AK, Kar IB, Mishra N, Raut S. Karapandzic Flap in Reconstruction of Post-traumatic Lower Lip Defects: Report of Two Cases. J Maxillofac Oral Surg. 2015 Sep. 14 (3):858-61. [Medline]. Khan AA, Kulkarni JV. Karapandzic flap. Indian J Dent. 2014 Apr. 5 (2):107-9. [Medline]. Teemul TA, Telfer A, Singh RP, Telfer MR. The versatility of the Karapandzic flap: A review of 65 cases with patient-reported outcomes. J Craniomaxillofac Surg. 2017 Feb. 45 (2):325-329. [Medline]. Dediol E, Čvrljević I, Dobranić M, Uglešić V. Extended Karapandzic Flap Technique for Reconstruction of Lower Lip and Chin Defect. J Oral Maxillofac Surg. 2018 Jan. 76 (1):213-220. [Medline]. Jabaley ME, Clement RL, Orcutt TW. Myocutaneous flaps in lip reconstruction. Applications of the Karapandzic principle. Plast Reconstr Surg. 1977 May. 59(5):680-8. [Medline]. Renner GJ, Zitsch RP 3rd. Reconstruction of the lip. Otolaryngol Clin North Am. 1990 Oct. 23(5):975-90. [Medline]. Goslen JB, Thomas JR. Cancer of the perioral region. Dermatol Clin. 1989 Oct. 7(4):733-49. [Medline]. Panje WR. Lip reconstruction. Otolaryngol Clin North Am. 1982 Feb. 15(1):169-78. [Medline]. Ebrahimi A, Kalantar Motamedi MH, Ebrahimi A, Kazemi M, Shams A, Hashemzadeh H. Lip Reconstruction after Tumor Ablation. World J Plast Surg. 2016 Jan. 5 (1):15-25. [Medline]. [Full Text]. Abbe R. A new plastic operation for the relief of deformity due to double hairlip. Med Record. 1898. 53:447. Estlander JA. Eine methode aus er einen ippe substanzverluste der anderen zu ersetzein. Arch Klin Chir. 1872. 14:622. Fernández-Casado A, Toll A, Pujol RM. Reconstruction of defects in paramedian upper lip. Dermatol Surg. 2009 Oct. 35(10):1541-4. [Medline]. Goldberg LH, Peterson SR, Silapunt S. Reconstruction of a large surgical defect involving the upper lip. Dermatol Surg. 2005 Feb. 31(2):206-9. [Medline]. Patient B. Wedge excision of the lower lip. Full-thickness lip defect. Patient B. Reapproximation of the orbicularis oris muscle. Patient B. Reapproximation of the vermilion-cutaneous border. Patient B. Result immediately after surgery. Patient B. Appearance 3 months after surgery. Patient C. Unilateral advancement flap used to repair a Mohs surgical defect. Patient C. Photograph obtained immediately after surgery. Patient C. Result 4 weeks after surgery. Patient E. Unilateral rotation flap used to repair a Mohs surgical defect on the right lateral upper cutaneous lip. Patient E. Appearance of the rotation flap immediately after surgery. Note the placement of the major portion of the incision in the melolabial fold. Patient E. Postoperative result 3 months after surgery.